Immerse yourself in regal architecture and explore the Thar Desert- bashing dunes, camping, dancing and enjoying the delectable Rajasthani cuisine. Imbued in golden hues, the city will remind you of kingdoms and queens of the era bygone, dusted by the sands of time. Latticed with yellow sandstone architecture, the princely city of Jaisalmer lies at the edge of the north-western state of Rajasthan. An archaic fort crowns the hill in the midst of the city. Known as the Jaisalmer City Fort, it continues to live, as one fourth of the old city’s population still resides within its walls. The fort is spread above the surrounding countryside which is specked with pastel coloured houses, by-lanes and treasured greenery, which can be viewed once you reach the top. 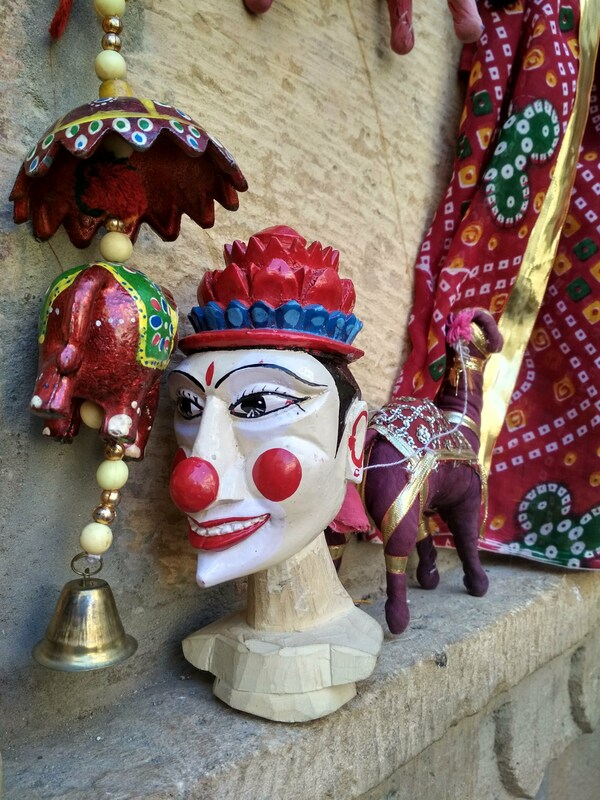 The lanes within the Jaisalmer City Fort are crowded with tourists and locals alike, who enjoy shopping from stores selling handicrafts like kathputli (wooden puppet dolls), bandhini (a dying technique) dupatta (stoles), jooti (traditional flat footwear) and “magical” bed sheets, accompanied by a number of restaurants which offer authentic Rajasthani cuisine. A short walk from the City Fort, one can discover the Patwon Ki Haveli, a cluster of five magnificent havelis (mansions) constructed and owned by a rich family of brocade merchants in the 19th century. Stepping inside the tan gates, you will realize on careful observation that the architectural aesthetics are individualistic to different sections of the five havelis. The walls have patches of paintings and mirror work which have survived till date and are maintained by the Archaeological Survey of India, which also administers the in-house museum. 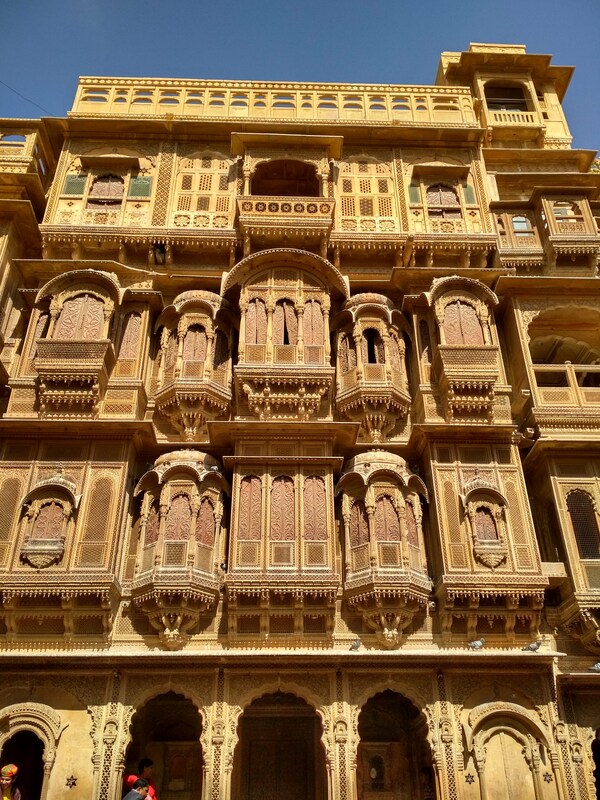 Apart from its forts, havelis and palaces, the Jaisalmer district is also popular for the Gadisar Lake and the city’s Jain heritage, spotted with a number of Jain temples made of yellow sandstone and decorated with intricate engravings from the medieval era. You can take the highway, board the rail or come meandering through clouds to experience this golden city. The weather is particular to the desert state, warmth embracing you during the day, but as night falls, teeth begin to chatter. Roll down the car window en-route to the Kanoi village, breathing in the summery winds to look at a golden landscape lined with windmills over the horizon as you pass by the Jaisalmer Wind Park. 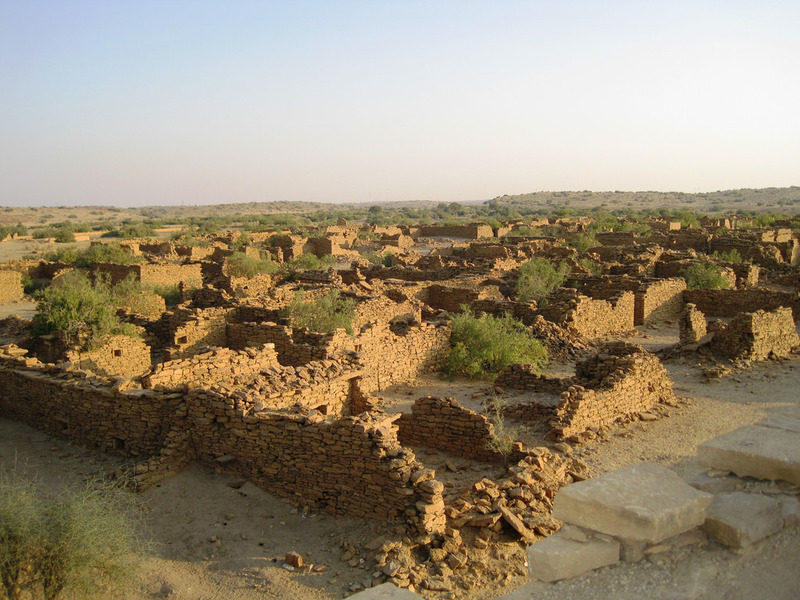 Indulging in the paranormal, you may visit the ruins of Kuldhara, an abandoned village 34km from Jaisalmer city, a minor diversion on the route to Kanoi. The tourist infested ruins have acquired the reputation of being haunted, with moving shadows, creepy voices and talking spirits, claimed to be spotted post dusk. About 42km from the main city and farther into the Thar, a tourist hub is prospering. 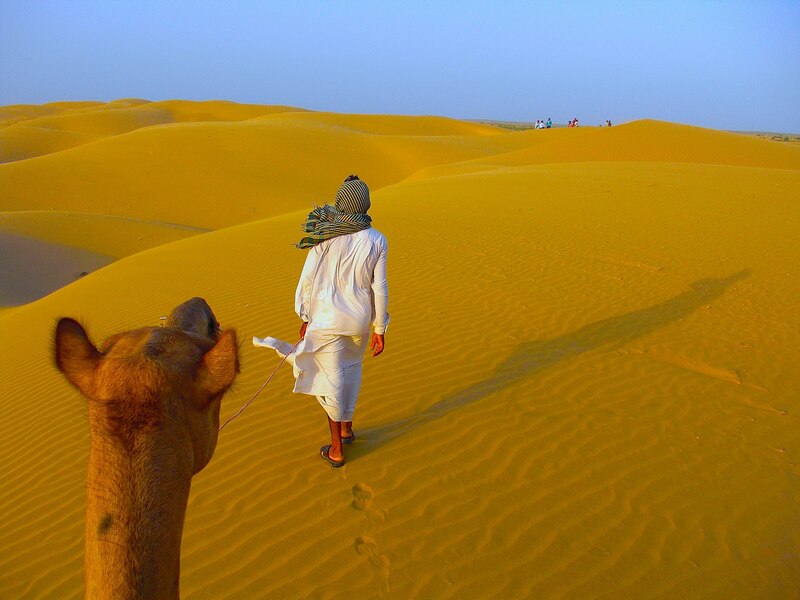 The Sam Sand Dunes in Kanoi is a natural dune site with deep crevices and tall dunes, suitable for camel riding trips, desert camping and dune bashing- many private resorts and campsites offering packages for these leisure activities. Mud camps and tents offer an offbeat lodging option, and you can spend your evening staring at the stars pouring into the open sky, while enjoying traditional Rajasthani Thali (traditional food platter) and Ghoomar folk dance by learned dancers. As you camel-ride to watch the sunrise or sunset, you will fall in love with the camels as they race over dunes, your belly dancing on the saddle, while the raw and bare desert landscape poses as a photographic treat. Jeeps and ATVs (All Terrain Vehicles) are available for desert safaris and dune bashing respectively, at per hour costs. 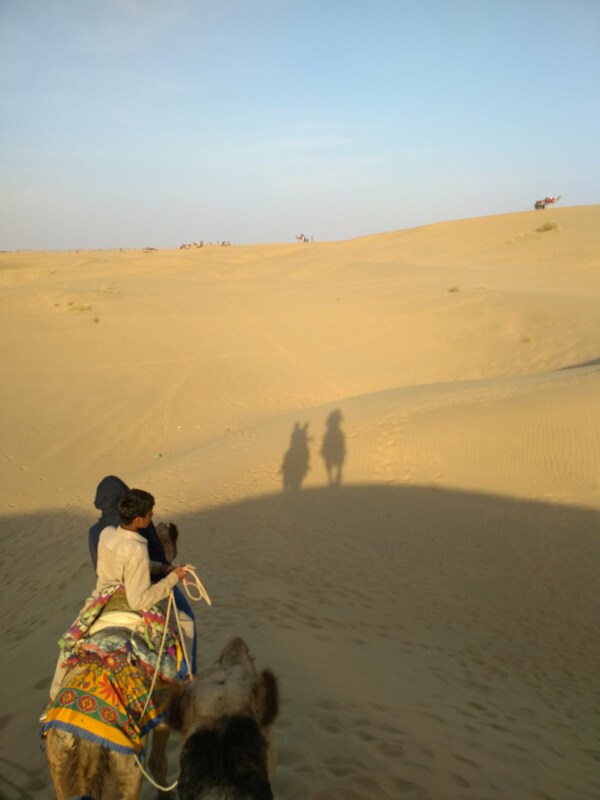 If you do not wish to rendezvous with too many tourists, you can head to the Khuri village, situated at a distance of about 50 km from Jaisalmer city, which is a more secluded retreat with fewer resort options and smaller dunes, but the traditional experience of a Rajasthani village.